When your customers search for your product or service, are they finding you or your competition? 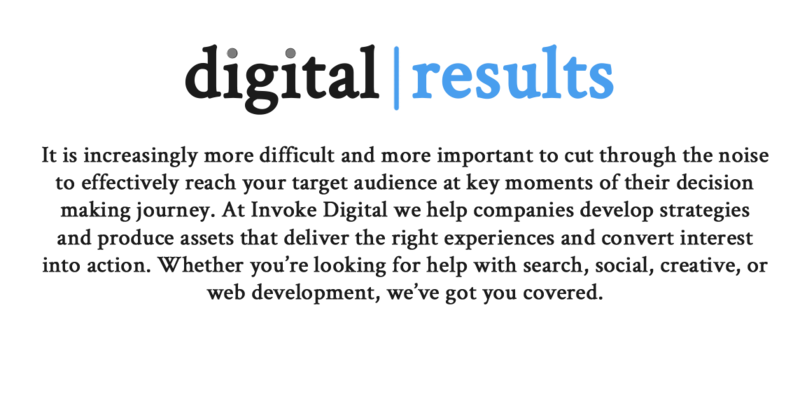 At Invoke Digital, we help improve your website’s visibility for relevant searches that capture users within specific cross-sections of the purchase funnel. Need to create awareness for your product or capture demand at the tail-end of the purchase funnel? Need to do it in a way that’s cost effective and delivers a positive ROI and ROAS? We implement proven strategies that help reach the right users with the most relevant messaging, at the right place and time. Our approach to carefully considers the needs of all stakeholders to create an enjoyable, intuitive user experience across all devices. Our team implements architecture and creative that’s on brand and supports your business and marketing goals. We always consider and utilize the latest available technologies, frameworks, UI and UX best practices. Ready for results? Let’s talk about how we can help!